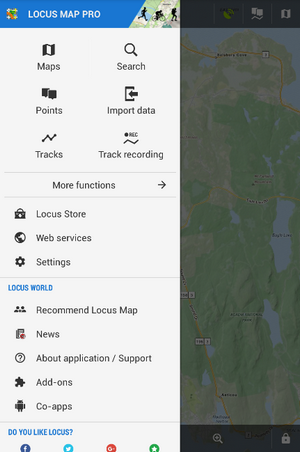 How Can I Control Locus Map? 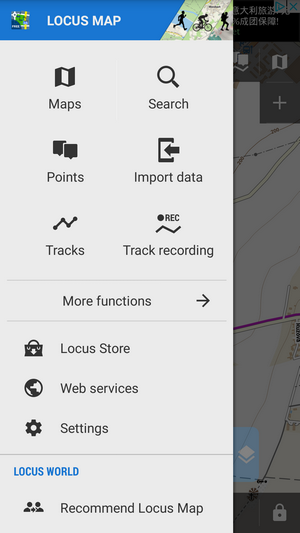 After the installation the main Locus screen with open main menu appears: You can slide the menu back to the left and proceed with the main screen or try the Menu items - Maps, Points, Tracks etc. The screen is covered by an online map which Locus Map automatically selected by the country you are in at the moment of installation. E.g. Hungarians see Turaterkep Classic map, New Zealanders NZTopoMaps, USGS maps are displayed to the US users etc. Anyway, you will never be left without a map, provided you are still online. you can move the map by simple touching and dragging, zoom it in/out by tapping buttons or by pinching . If you prefer single hand control, you can double-tap and drag the map to zoom it. if you want to see your positition on the map, tap the centering button in the lower left corner. Your position is aligned with the cursor . if you want to rotate the map according to your direction, tap the button next to the centering. If your phone or tablet is equipped with hardware compass, you can select “Rotate map” or Show view option from a popup menu - this helps when you want to know what direction your are watching (if your phone or tablet does not have hardware compass, this menu is deactivated). locks map zoom, all map screen and what's more, it offers also a magnifier lens! That your grandma will surely approve of. if you'd like to change the map on the screen, tap button in the upper right corner. 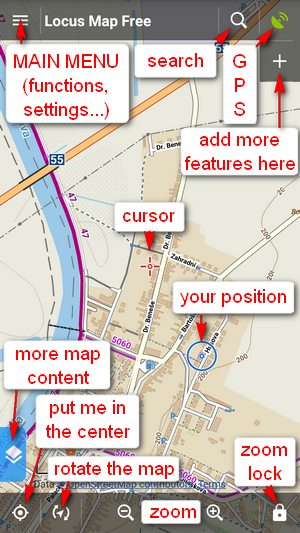 It switches on the map menu that offers a wide selection of online maps to display and download for offline usage. Just choose a map you'd like to browse or travel with and tap it. Make sure you are connected to the internet when you use online maps! More functions show other Functions of Locus Map.